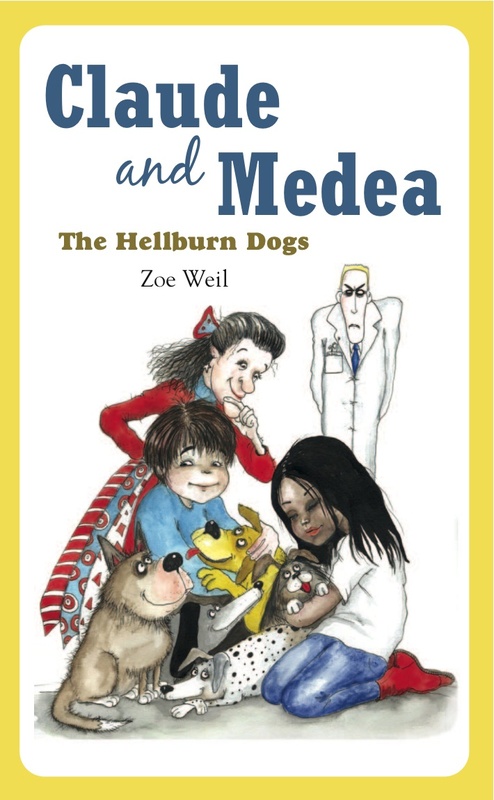 Authored by humane educator extraordinaire Zoe Weil, Claude and Medea traces the compassionate awakening of two twelve year olds. Both students at a prestigious private school in Manhattan, Claude comes from a background of wealth and privilege while his classmate Medea’s background is working class. The two are not friends at the opening of the book, but when an unconventional substitute teacher arrives at their school, they both hear the depths of her messages of compassion and independent thinking in a way that their classmates do not. Bonded by their willingness to discuss Mrs. Rattlebee’s teachings, the two embark on a scheme to find out why dogs in New York City are disappearing. Marshaling the support of some of Medea’s friends and family, Claude and Medea quickly realize that they had not anticipated the seriousness of the situation. City dogs are being abducted and sold to Hellburn Research Institute, an animal testing facility across the Hudson River in New Jersey. The children concoct a risky rescue and extraction plan, which they successfully execute with the assistance of their cohorts. The compassionate kids rescue dogs (including ones with substances still in their system) and a rat. Not content to rest on their laurels, once the rescue is complete, they also send press releases and get several major media hits regarding the abduction of the dogs and the truth about what is happening at the research facility. There is a lot to appreciate about this book. One of the protagonists is a long time vegetarian, and the other converts to vegetarianism shortly into the story. The messages imparted by the mysterious unique substitute teacher clearly resonate with the two students, and her impressions are lasting. Though Mrs. Rattlebee’s physical presence in their lives is transitory, the seeds of curiosity, compassion and mercy that she planted continue to blossom. The story moves along quickly with rich details about the situations and characters, and Claude and Medea are smart, savvy problem solvers. One quibble that veg folks may have is the portrayal of Mrs. Rattlebee’s demeanor and appearance, especially when she channels a fictional creature using her body as a vessel. Though her message is one we can all get behind, she embodies a stereotype that may not ring true to many children today, children who are growing up knowing some very mainstream veg*s — doctors, lawyers, teachers, artists, business owners, engineers etc. Vegans and vegetarians who do not identify as quirky counterculturalists may not appreciate this aspect of Mrs. Rattlebee’s character. While I highly recommend this story for older kids from a humane education standpoint, I feel compelled to mention that much of the success of the Hellburn Dogs (and Rat) rescue comes about because Claude, Medea and their crew engage in mistruths ranging from small fibs to significant lies to their parents and other adults. Are the two using some harmless subterfuge to speak truth to power, or are they lying, scheming kids? Are the two mutually exclusive? Parents will need to figure out how they feel about this issue. Additionally, when I read this story, it struck me that the kids could potentially be held liable under the 2006 Animal Enterprise Terrorism Act, which in part addresses animal research facilities. Not familiar with this piece of obscure legislation? Read more about it here. Claude and Medea ends with Hellburn Reseach Institute being shut down and Dr. Hellburn and his associates being arrested because of their actions. Would this happen in real life? I’m not sure but it is something for parents and other adults to contemplate.